You are probably so stunned about the news of Kim Kardashian’s pending divorce and Tony LaRussa’s retirement that you feel like a beer right this minute. But imagine if you were up in space. Shocking news filters through, you need to sip on a cold one, and well, there are certain logistical problems. Like burping. When you burp in space, the liquid tends to come up with the bubbles and, well, what results wouldn’t go down well at the French Laundry. You might, however, be familiar with Vostok 4-Pines Stout. This is the beery brainchild of Justin Mitchell, a gastro pub owner, and Jason Held, an aeronautical engineer. They announced their project last year. However, the way that Bloomberg Businessweek serves it, this beer is very much closer to being a celestial breakthrough in beverages. 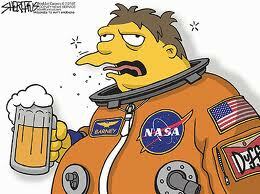 Held, who once worked for NASA, and Mitchell got the idea for 4-Pines Vostok when they got drunk together. Actually, that is just my imagination, but when Held moved to Australia, Mitchell’s 4-Pines Brewery happened to be Held’s local pub, so please allow me the flight of fancy. The problems they faced were considerable.